No one likes to think about drain cleaning, but it’s a fact of life in most houses that before long, you are going to need a plumber out to help with this often unpleasant job. Don’t worry – the experts at Beaverton Plumbing, located near Portland, OR, realize that it might be a “dirty job” but someone’s got to do it – and we are up to the task. Hair, gunk, grease, soap build-up, and more create the conditions that contribute to the need for drain cleaning. And drain cleaning might need to be done in any or all places in your house where you have sinks – whether it’s the bathroom drain, the kitchen drain, the laundry room drain, or even the basement drain. How do you know if you need someone out to do drain cleaning? It’s easy to tell…you’ll be faced with lazy draining, or, when the problem becomes too big, standing water. Of course there are some remedies you can take yourself, from using a plunger, to solutions such as vinegar and baking soda. Often the combination of these two household cleaner will “fizz away” whatever is clogging your drain. If the clog is resistant, other options for “do it yourself” (DIY)drain cleaning include a common wire hanger or a “plumber’s snake.” Note that we don’t recommend the harsh commercial drain cleaners on the market as their corrosive properties can harm your pipes – and the environment. Typically only one area, such as the shower or laundry sink, will be affected and then you know exactly where the problem is. 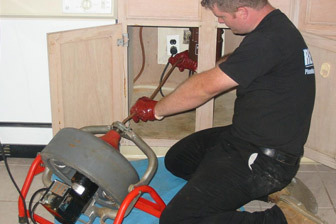 But if more than one plumbing fixture is backed up at once, the culprit is likely a clog in your main line – and no home remedywill fix that. Whether it’s a whole-house problem or a single stubborn clog you can’t get free – or you just simply don’t want to handle this chore yourself — call the experts at Beaverton Plumbing who will come and perform the drain cleaning that’s necessary to make sure they are free flowing.